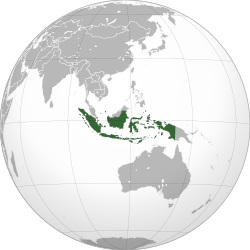 Indonesia is a country in Southeast Asia and Australasia/Oceania. It is part of the Malay Islands. It has 18,108 islands. People live on about 6,000 of these islands. The most important islands of Indonesia are Java, Bali, Borneo, Sulawesi, and Sumatra. The capital of Indonesia is Jakarta, on Java. The president now is Joko Widodo. Modern Indonesia began on the 17th of August 1945. At 10 o'clock on that Friday morning, Ir. Soekarno read Indonesia's Declaration of Independence. Indonesia's Independence Day is a national holiday. Indonesia is the fourth most populated country in the world with 238,452,952 people (2004 est.) Half of the population lives in Java, There are 111 people per km² and the population of men and women is roughly equal. The land area is 1.904 million km2, or slightly smaller than Mexico. The official language of Indonesia is Bahasa Indonesia, but a total of 737 languages are spoken in different parts of Indonesia. Most of these many languages are only spoken among remote tribal groups. Other languages widely spoken in Indonesia include Javanese, Balinese and Sundanese. Indonesia's neighbors are Papua New Guinea, Malaysia, and East Timor which share land borders with Indonesia. Other nearby countries are Australia to the south, Singapore to the Northwest, and Philippines to the Northeast. Indonesia has the most active volcanoes of any country in the world. It also close to fault lines so there are many earthquakes and tsunamis. Most people in Indonesia follow Islam, but Indonesia is not an Islamic country by law. Indonesia has the largest Muslim population on earth. Other religions Indonesians follow include Christianity (Protestant and Roman Catholic), Hinduism, and Buddhism. Indonesia has a written history as far back as the 7th century. Before the colonial Dutch came in the 1596, Indonesia was made up of many kingdoms in that were constantly fighting each other. Indonesia was ruled by the Netherlands from the 17th century until World War II. The country was then called the Dutch East Indies. During World War II, the Japanese drove out the Dutch and took control of Indonesia. After Japan surrendered in the war, Indonesia claimed its independence on the 17th of August 1945. The proclamation was read by Ir. Soekarno in Jakarta. Soekarno later became Indonesia's first President. British troops came into Indonesia to restore peace and to rescue Europeans who had been prisoners of the Japanese. The British troops also had the job of shipping home 300,000 Japanese troops. The Indonesian Republicans fought the British troops, because it was expected that the British would give Indonesia back to the Dutch. The Indonesian Republicans killed many of the Japanese prisoners, before they could be sent home. They also began killing people from minority groups who might be against the new Republic. Many European and Indonesian European people were killed. Many Chinese business people and other minority groups were killed or made homeless. In Java there were many thousands of homeless people. In 1946, the Dutch came back. When the British left in 1947, there were 55,000 Dutch soldiers in Indonesia. The Dutch action was called "Operatie Product" or "Politionele Acties". The Indonesian Republicans fought the Dutch until 1949. But the Indonesian Republicans were badly organised and often fought among themselves. As the Dutch forced the Republican soldiers out of different areas, they moved in more troops until there were 100,000 Dutch troops. The Dutch refused to obey the United Nations who said they should stop the fighting in Indonesia. The United States of America organised for meetings between Dutch and Indonesian leaders. The Dutch finally agreed to recognise Indonesia's independence in November 1949. Because of the fighting and the bad organisation, it took a long time for the country to become peaceful, and for the economy to get better. Many Indonesian soldiers had died, between 45,000 and 100,000. Also, a very large number of civilians (people not in the army), Indonesians, Europeans and Chinese, had died; perhaps as many as 200,000. Indonesia has 34 provinces. Five of them have special status. Each province has its own legislature and governor. The provinces are divided into regencies (kabupaten) and cities (kota). These are further divided into districts (kecamatan), and again into village groupings (either desa or kelurahan). There are people of many different cultural groups living in Indonesia, has more than 700 ethnic groups. It is affected by Indians, Chinese people, Arabs, Malays and Europeans. The Javan hawk-eagle is the national bird. Wisma 46, Indonesia's tallest office building, in the middle of Jakarta skyscraper. ↑ Indonesia (Country Studies ed.). US Library of Congress. http://countrystudies.us/indonesia/86.htm. ↑ Vickers, Adrian (2005). A History of Modern Indonesia. Cambridge University Press. ISBN 0-521-54262-6. ↑ 3.0 3.1 3.2 3.3 3.4 "Indonesia". International Monetary Fund. Retrieved 26 October 2011. ↑ "Human Development Report 2011". 2011. Retrieved 2 November 2011. This page was last changed on 10 April 2019, at 23:32.